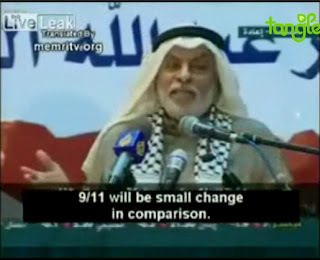 Following are excerpts from an address by Saudi cleric Khaled Al-Khlewi, which aired on Al-Jazeera TV on January 11, 2009. Khaled Al-Khlewi: The [Jewish] Qaynuqa tribe betrayed the Prophet Muhammad. A woman went to a Jewish market in order to buy a piece of jewelry. 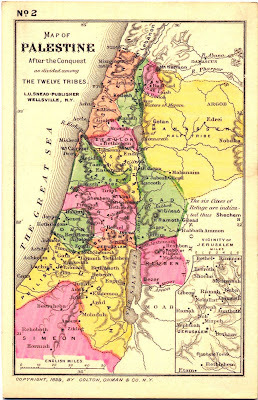 The members of the Qaynuqa tribe were the most ruthless and wealthiest Jews. When the Muslim woman reached the market, what did they do to her? A Jew sneaked behind her, and tied her gown to her headdress, so when she tried to get up, her private parts were exposed. She cried for help, and one of the Prophet’s companions came and killed the Jew. Then the Jews ganged up on him and killed him. When the Prophet Muhammad learned about this, he fought the Qaynuqa tribe and banished them. This is the only way to deal with them. In the case of the Qurayza tribe – or rather, the Nazir tribe – the Prophet Muhammad went to them, and learned against a wall. Some of the Jews said: “The Prophet Muhammad is leaning against the wall. Someone should go to the top of the roof and throw a rock on his head.” Then the Angel Gabriel appeared, and informed the Prophet in advance about this treachery. So the Prophet Muhammad banished them. The Prophet carried out the greatest killing among the Qaynuqa tribe, because they had violated their covenant with him. So, my friends, the conclusion we may draw from this introduction is that with the Jews, nothing works but force. Memorize the following parable, just like I learned it from others: “Kiss the head of a Jew, and he will deceive you – deceive him, and he will kiss your head.” The Jew is treacherous, disloyal, deceitful, and belligerent by nature. Nothing works with him but force. They have formed clandestine groups in Islamic societies, as well as internationally. Marxism was founded by Karl Marx the Jew. The Austrian journalist who preached the establishment of Israel, 50 years later – Theodor Herzl – was a Jew as well. Many U.S. Congressmen are Jews. Most of the media moguls are Jews. Who can tell us the slogan that points to the geographic [aspirations] of the Jews? What is their slogan? Well done! Come up here, my dear… Excellent! Come on up, this way. Come here, my dear, here, so we can see you. Khaled Al-Khlewi: Welcome, my dear. [kisses him] What’s your name? Khaled Al-Khlewi: Omar? Allah Akbar. They hate Omar and are afraid of him. Omar what? What’s your dad’s name? Omar: From the river to the Euphrates. Khaled Al-Khlewi: From the Nile to the Euphrates. Let’s rephrase it: From the Euphrates to the Nile. 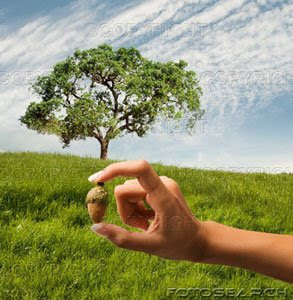 Now let me complete it for you: And from the cedar to the palm tree. Okay. Who can tell me which countries this represents? From the Euphrates to the Nile – two countries. From the cedar to the palm tree – two countries. Four countries altogether. Who can explain this expression, by telling me what countries it refers to? Go ahead. Iraq and Egypt. Well done. “From the Euphrates” means Iraq. “To the Nile” means Egypt. “From the cedar” – where’s that? Lebanon. “To the palm tree”? Saudi Arabia – because they believe that Al-Madina belongs to them, and that they should return to it. The problem is not Gaza alone. They have broader aspirations. The Arab rulers and politicians must understand this problem. The Jews are motivated by religious considerations, not only by political, economic, or geographic considerations. They are motivated by their religion, and they want to achieve this. What is your first name – Mahmoud, right? And your dad’s name? What’s your first name? Khaled Al-Khlewi: Well done. They wanted to kill the Prophet Muhammad. And what are they doing to our Muslim brothers now? They are killing them. When you curse them, what do you say? “Oh God…”? Khaled Al-Khlewi: The Muslims. Well done, my dear. Do you want to come with me to Saudi Arabia? I have a son like you, called Abdallah. You can play with him. Will you come with me? Will you give me this nice jacket you are wearing? Let me give you some water… May Allah protect you. I will give you this book and some water. Goodbye, my dear. The night before last I had a dream that Rav Yisroel Salanter Z'L came to me while I was sleeping to give me chizuk. Though I knew it was him, he appeared to me in the form of Rav Noach Weinberg Z'L. I don't remeber the words he spoke. Rabbi Josh Kohl will be giving a live online drasha about Birkas HaChama! Is there true evil in the world? Watch this and decide. On April 8, 2009, millions of Jews worldwide will unite in the most spectacular event of the past three decades. Jerusalem, Israel (January 2009) — Once every 28 years, the sun returns to the exact position of Creation, and Jews all over the world gather together to make Birkas HaChamah, the blessing of the sun. What is the meaning of this momentous event that happens only every few decades? How can we maximize our growth as we count down toward this rare natural phenomenon? Targum Press is proud to present the ultimate book on Birkas HaChamah: Once in 28 Years, by renowned educator and author Rabbi Moshe Goldberger. In this unique handbook packed with fascinating facts and practical ideas for growth, the author uncovers the meaning and depth of Birkas HaChamah and the life lessons we can learn from it. With a comprehensive explanation of the blessing, a clear overview of its pertinent laws and customs, and an exploration of this event’s continual significance, Once in 28 Years allows us to harness the power and inspiration of Birkas HaChamah and keep its message reverberating in our lives for the next 28 years. Since the last time that birkas hachama was recited, Jewish awareness and pride has literally exploded. In anticipation of April 8, 2009, thousands of both religious and secular Jews are searching for the laws and meaning of this upcoming event, which for some will be a first-time experience. Once in 28 Years builds up the excitement for the occasion, with 28 chapters of information and inspiration. It is the ideal book to use as a series in a newsletter, for teacher gifts, or as part of a schoolwide event to educate students about Birkas HaChamah. 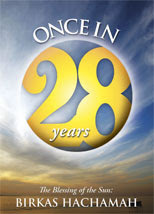 Practical, inspiring, and easy to read, Once in 28 Years is an invaluable book for every Torah Jew. Me: Excellent book with all the halachos and philosphy about this amazing mitzvah. Nice hardcover binding and not filled with any extra fluff. It also comes with a nifty laminated card of all the brachos and necessary tefilos. If you would like to buy a copy, PLEASE click the graphic on the sidebar. With live video, time line and virtual tour! Iran Can Get Material to Make 50 Nukes. When do we act? (from Fox News) Iran can develop a nuclear weapon within a year and has ready access to enough fissile material to produce up to 50 nuclear weapons, according to a panel of current and former U.S. officials advising the Obama administration. William Schneider, Jr., chairman of the Defense Science Board and a former under secretary of state in the Reagan administration, offered those estimates Wednesday during a news conference announcing the release of a new "Presidential Task Force" report on Iran by the Washington Institute for Near East Policy. The report, entitled "Preventing a Cascade of Instability: U.S. Engagement to Check Iranian Nuclear Progress," was signed by a team of policymakers, former officials and Iran scholars that included Sen. Evan Bayh, D-Ind..
Also signing on to the early draft form were two individuals expected to play significant roles in the development of the Obama administration's foreign policy: former Ambassador Dennis Ross, named last month by Secretary of State Hillary Clinton as a special envoy on the Iran issue, and Robert Einhorn, a former assistant secretary of state who is expected to accept a senior position dealing with non-proliferation issues. The "cascade" refers to a set of 164 high-speed centrifuges used to enrich uranium to the high levels necessary to produce a nuclear weapon. The United Nations' nuclear watchdog, the International Atomic Energy Agency, recently reported that Iran has enough low enriched uranium to produce a nuclear weapon, and currently has 5,600 centrifuges operating at its pilot enrichment facility in Natanz. Iran has declared its intention to add another 45,000 centrifuges over the next five years. But Schneider said Iran has already "perfected the industrial aspects of enriching uranium," and can easily develop a nuclear weapon long before 2014. "The ability to go from low enriched uranium to highly enriched uranium, especially if [the Iranians] expand the number of centrifuges, would be a relatively brief period of time, perhaps a year or so, before they'd be able to produce a nuclear weapon," Schneider said at the news conference. "So it's not a long-distance kind of problem." Moreover, Schneider warned that the fundamentalist Islamic regime in Tehran -- which has threatened to wipe Israel off the map and equipped and funded regional terrorist groups like Hamas and Hezbollah -- has access to significant amounts of the raw fissile material that would be the core ingredient in such a nuclear arsenal. These indigenous natural resources include "yellowcake," the raw uranium ore that is converted to gas and then fed into the cascades of centrifuges. "Iran has enough yellowcake in the country to perhaps produce enough highly enriched uranium, if they go to that length, to produce perhaps fifty nuclear weapons," Schneider said. Neither of the other two panel members who appeared alongside Schneider at the news conference -- Eugene Habiger, a retried four-star general and former commander in chief of the U.S. Strategic Command, and Nancy Soderberg, a former ambassador to the U.N. and National Security Council staffer during the Clinton administration -- disputed Schneider's claims. The Washington Instiyute's nine-page report also warned that Israel "may feel compelled" to take military action to try to destroy or retard the Iranian nuclear program if Russia sells the S-300 surface-to-air missile system to Iran. "Israeli leaders seem convinced that at least for now, they have a military option," the report states. "However, Israelis see the option fading over the next one to two years, not only because of Iran's nuclear progress and dispersion of its program but also because of improved Iranian air defenses, especially the expected delivery of the S-300. ... Israel therefore may feel compelled to act before the option disappears." Schneider, who along with Habiger and Soderberg conferred with high-level officials from Israel, Jordan, Qatar, and Bahrain during a trip to the Middle East last December, reported that the Israeli military still believes it can hold the Iranian nuclear apparatus "at risk," but will no longer hold that view if Tehran acquires more sophisticated air defense technology from Moscow. "It is the transfer of the S-300 that is likely to be a trigger for Israeli action," Schneider said. "The time frame is getting compressed and we need to act quickly if we are going to be successful [in resolving the issue peacefully]." "Time is not on our side," agreed Habiger. "We've been mucking about on this issue for years now." Habiger and Soderberg said it remains possible for the U.S., by working with Russia, China and Arab allies in the Persian Gulf, to persuade Iran not to obtain a nuclear weapon. 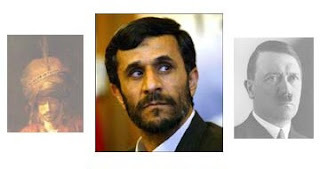 "They are a rational actor," Soderberg said of the Iranian regime. "They are deterrable." If the costs of pursuing the nuclear program are made sufficiently high, the panel said -- particularly through the imposition of sanctions on Iran's oil and gas sector -- Tehran's "cost-benefit analysis" could be changed. Iran's defense minister visited Moscow last month to press for the Russian state-controlled arms exporter, Rosoboronexport, to sell Iran the S-300 system. Russian officials, at least publicly, were non-committal. However, Iran signed a $700 million contract with Russia in 2005 to purchase 29 low-to-medium altitude surface-to-air missiles, which were delivered the following year and became operational in early 2007. Egyptian Cleric Amin Al-Ansari Justifies the Holocaust, Airs Footage, and Declares: "This Is What We Hope Will Happen But, Allah Willing, at the Hand of the Muslims." One of the many reasons I can't wait for Moshaich to arrive: seeing this Amalekite forced to stand in front of G-d Almighty. Baruch HaShem! Tzahal is not the koach of Am Yisrael. 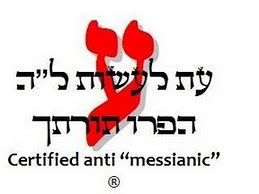 Hashem Tzivaot is our strength. Experts Warn That Downturn Could Drive Discontent, Help Extremists Recruit. From the Washington Post. Click HERE for the full article. A sane voice among the Arabs. I am not trying to introduce a chidush. This has probably a basic Rashi and am showing my ignorance, but here goes. 147 reads: "He gives the animal its food, to the young ravens which call out." In Hebrew there is a "mapik heh" which denotes that the bread is the animal's. נוֹתֵן לִבְהֵמָה לַחְמָהּ Lachmah... her bread. The lashon is very telling. Hashem gives food to the hungry human being; one who can, or at least should, realize from Whom his food is coming. The animal is one who assumes that the bread is her's to begin with. Perhaps Melech David is giving us a message. We can act like the animal and claim that we have is from our own hands: my money, my home, my car. Or we can use the human trait of emunah and realize that all we have was, is and will always be from Hashem's will. In fact 147 continues (after describing the animal): "He does not delight in the strength of the horse; He does not take pleasure in the legs of man. Hashem takes pleasure in those who fear him, in those who hope in His loving kindness." I have many friends who have been hit hard by the economic collapse, myself included. It is a daily struggle to remember that I am not in control. I can work hard and give everything 100%, but it is Hashem who runs the world. He not only sustains us weekly, but for evey second. Klal Yisrael needs to remember that and look to our Father in Heaven. The IDF, Obama's bailout, that vitamin you take in the morning... none can be successsful without the will of Hashem. Here are more of my favorite sites. Read 'em. Support 'em. Love 'em. They keep the Klal strong. "We see many miracles during this war and we must increase our prayers. Soon we will be zoche to see the Bet HaMikdash, very very very very soon in our days!" I have video! Will post tonight once I get it transferred. Jackass of the Right. I think he and Carter should mud wrestle. Judah's Hechsher of Blog Awesomeness! Here are my picks for the most Chazak Pro-Israel blogs. These are my "must reads." "The Palestinian people does not exist. The creation of a Palestinian state is only a means for continuing our struggle against the state of Israel for our Arab unity. In reality today there is no difference between Jordanians, Palestinians, Syrians and Lebanese. Only for political and tactical reasons do we speak today about the existence of a Palestinian people, since Arab national interests demand that we posit the existence of a distinct "Palestinian people" to oppose Zionism." "Then We [Allah] said to the Israelites: 'Dwell in this land [the Land of Israel]. When the promise of the hereafter [End of Days] comes to be fulfilled, We [Allah] shall assemble you [the Israelites] all together [in the Land of Israel]." Why doesn't Israel have the same right to self-defense as other nations? The world-wide protests against Israel's ground incursion into Gaza are so full of hatred that they leave me with the terrible feeling that these protests have little to do with the so-called disproportionality of the Israeli response to Hamas rockets, or the resulting civilian casualties. My fear is that the rage we see in the protesters marching in the streets is far more profound and dangerous than we would like to believe. There are a great many people in the world who, even after Auschwitz, just can't bear the Jewish state having the same rights they so readily grant to other nations. These voices insist Israel must take risks they would never dare ask of any other nation-state -- risks that threaten its very survival -- because they don't believe Israel should exist in the first place. Just look at the spate of attacks this week on Jews and Jewish institutions around the world: a car ramming into a synagogue in France; a Chabad menorah and Jewish-owned shops sprayed with swastikas in Belgium; a banner at an Australian rally demanding "clean the earth from dirty Zionists! "; demonstrators in the Netherlands chanting "Gas the Jews"; and in Florida, protestors demanding Jews "Go back to the ovens!" Hey! My sign made the Daily News. There I am in the back holding my protest sign. "Neturei Karta = Erev Rav"
Fast forward to: 5:49:25 to see his amazing speech. Remember, our enemies are not just in the Middle East. I have been actively working to support Israel and her sons as thy battle hard against the murderous terrorists of Gaza. One thing that I can't get past, however, is that none of this would be happening if the Israeli Government didn't relinquish our G-d given Land. Gush Katif residents are homeless. 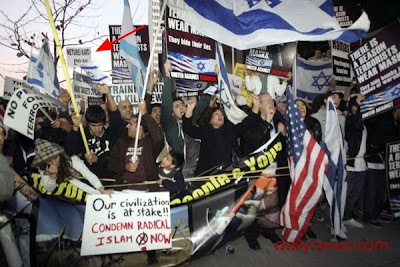 We watched as the so-called "Palestinians" burned down the synagogue there. We sat by as Hamas took power. Are we really surprised at the outcome? Will there be no learning curve? No dividing wall, land grab or peace plan will improve the situation. We are at war with a people whose blood lust is inhuman. They sacrifice their children, like the Canaanites of old, to a blood hungry god. Though this god is not called Molech, it is called "Jihad." Just as the nation of Israel had the moral, ethical and divine right to kill those who have no moral compass, no compassion; a people who are at their very core evil, so to do we have the obligation today to destroy our enemies. No negotiations with terrorists. No ceasefire with terrorists. No concessions to terrorists.